Infrastructures in Practice shows how infrastructures and daily life shape each other. Power grids, roads and broadband make modern lifestyles possible – at the same time, their design and day-to-day operation depends on what people do at home and at work. This volume investigates the entanglement of supply and demand. It explains how standards and 'normal' ways of living have changed over time and how infrastructures have changed with them. Studies of grid expansion and disruption, heating systems, the internet, urban planning and office standards, smart meters and demand management reveal this dynamic interdependence. 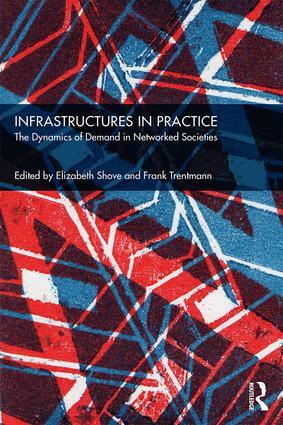 This is the first book to examine the interdependence between infrastructures and the practices of daily life. It offers an analysis of how new technologies, lifestyles and standards become normalised and fall out of use. It brings together diverse disciplines – history, sociology, science studies – to develop social theories and accounts of how infrastructures and practices constitute each other at different scales and over time. It shows how networks and demands are steered and shaped, and how social and political visions are woven into infrastructures, past, present and future. Original, wide-ranging and theoretically informed, this book puts the many practices of daily life back into the study of infrastructures. The result is a fresh understanding of how resource-intensive forms of consumption and energy demand have come about and what is needed to move towards a more sustainable lower carbon future.